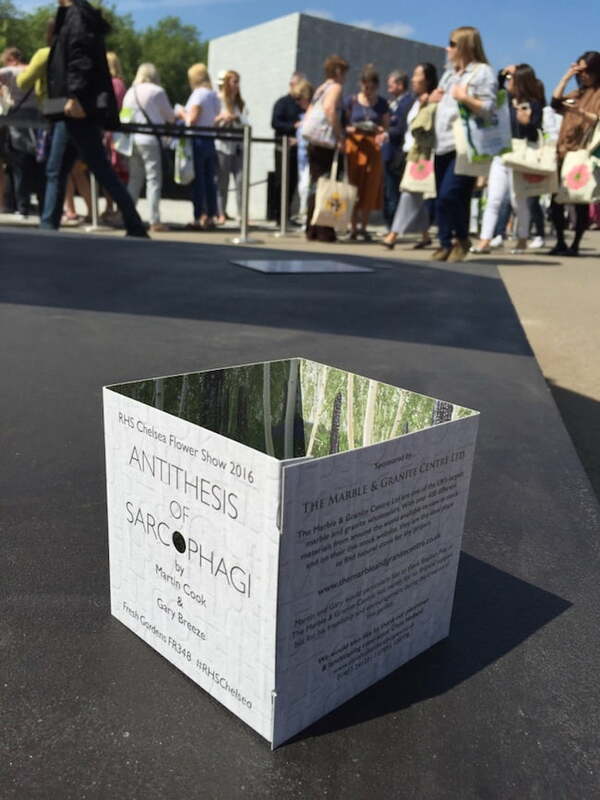 There is just so much to take in at the Chelsea Flower Show. So here is some more of the fun, fashion, flowers, fascination and fantastic gardens that makes Chelsea so special. 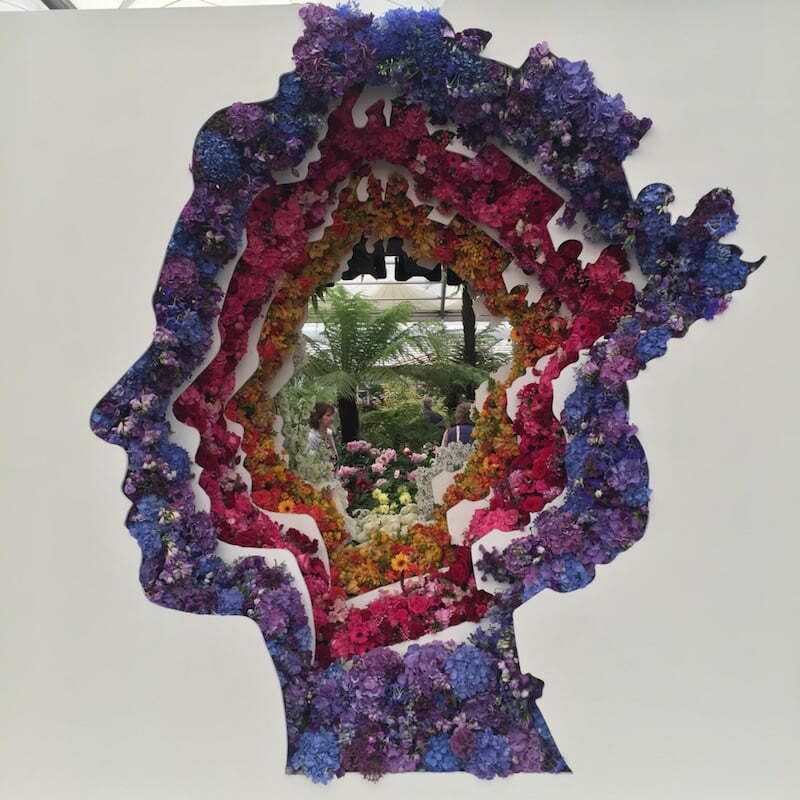 I seemed to experience a head theme at the show which may have been inspired by the wonderfully bright floral display depicting Queen Elizabeth II created by florist Ming Veevers Carter for the New Covent Garden Flower Market. The striking design was filled with hydrangeas, sweet peas, alliums, freesias, roses and many other flowers and was definitely a crowd pleaser, with Queen Elizabeth also giving it her approval. 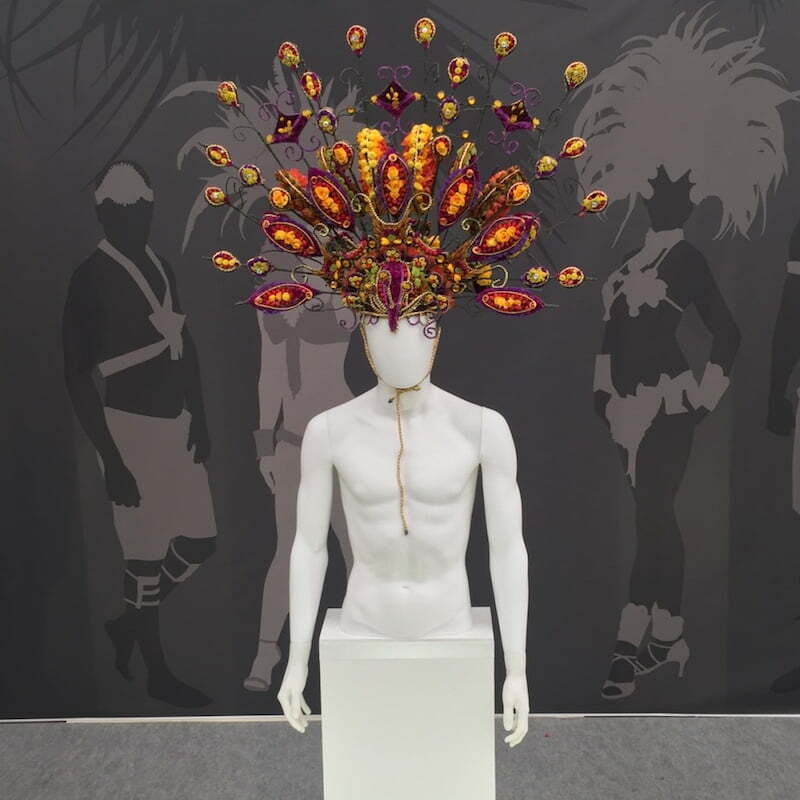 On a somewhat smaller scale were the amazing floristry head pieces which were interestingly displayed on masculine mannequins. Being the son of a floral artist I always enjoy seeing the floral arrangements, particularly those done in such a creative way. These were quite stunning with many of them looking quite tribal while others were delightfully soft and feminine. Such talented floral artists. And then of course there were some who came prepared with their own head pieces, from floral hats to this green Mohawk. I wondered if this young gent always wore it as green or whether he planned ahead thinking of which colour would suit his outing to the show, just like many others would do with their dresses and suits! 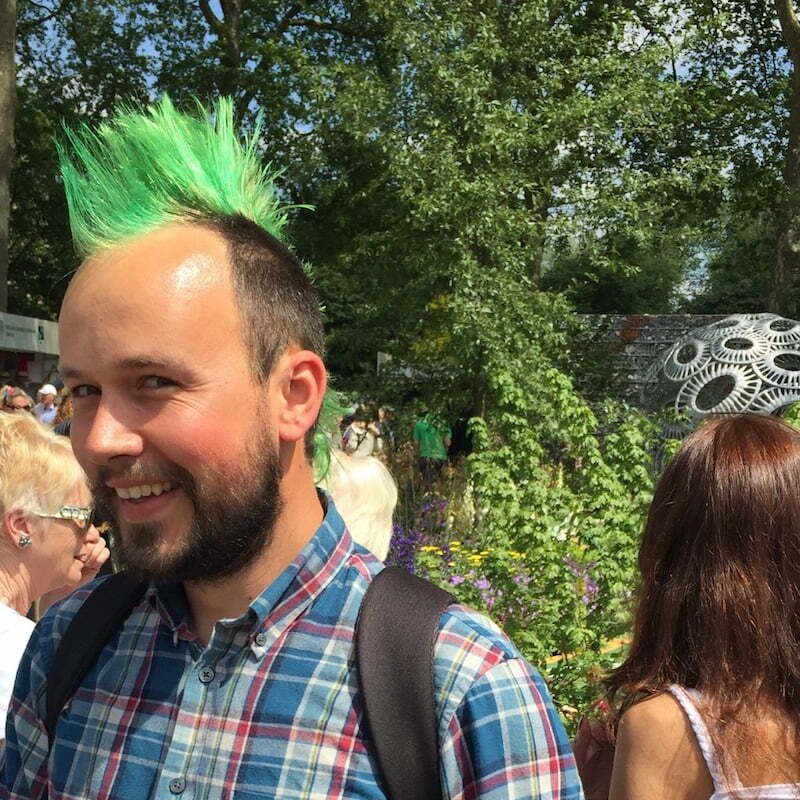 Either way he was most obliging, surprisingly perhaps even a little shy, when I asked him if I could take a photo and I concur that green was most suitable for the garden show! 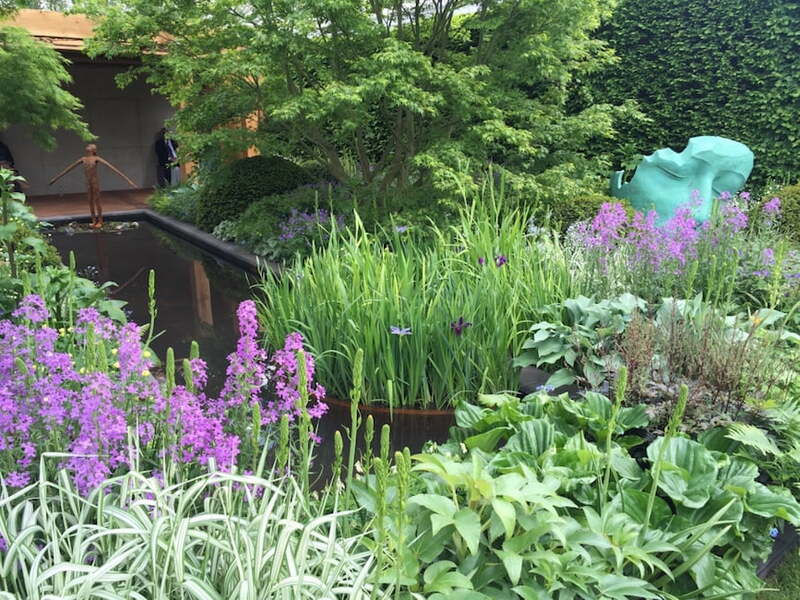 One of the enjoyable aspects of Chelsea is that it highlights that gardens can bring people together from various spectrums of life and I think this is the great strength of horticulture. From the passionate gardeners and horticulturists whose hearts beat faster when they see the latest floral display or plant combinations through to those who see an exhibit and want to know how they can buy it. Seriously, I did overhear one of those “I wish to buy those metal shards, who do I speak to?” inquiries about Andy Sturgeon’s Best in Show garden, and I have no doubt that she could afford it. 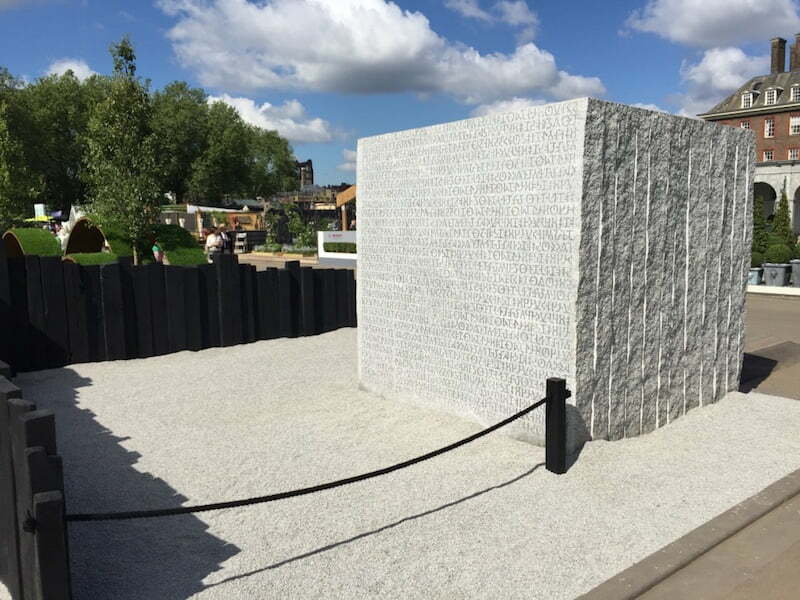 Another of the gardens that I found really intriguing was the The Marble and Granite Centre Garden – Antithesis of Sarcophagi, designed by Martin Cook and Gary Breeze which won Best in Show for the Fresh Gardens category. It was designed to represent a world turned inside out and is a garden inside a sculpture. From the outside it was quite stark and uninviting leaving me a little quizzical. 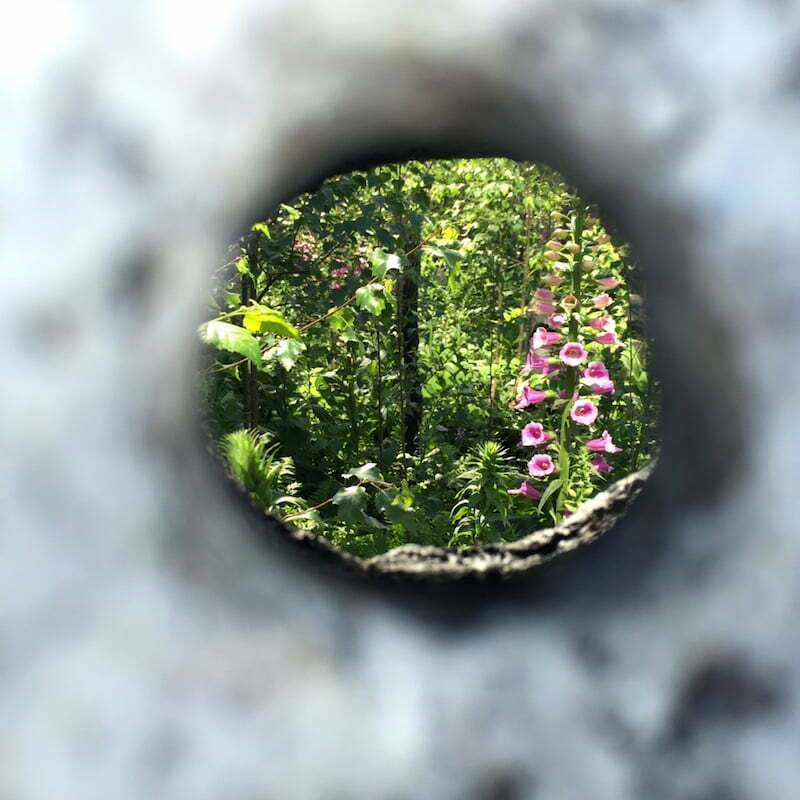 However, the fascination came when you walked up to it and peered through one of the many small holes positioned at varying heights around the cube. Inside was a delightful forest view which was quite unexpected and I think highlights perfectly the “don’t judge a book by its cover” principle. The Marble and Granite Centre Garden – Antithesis of Sarcophagi designed by Martin Cook and Gary Breeze. Chelsea Flower Show 2016. 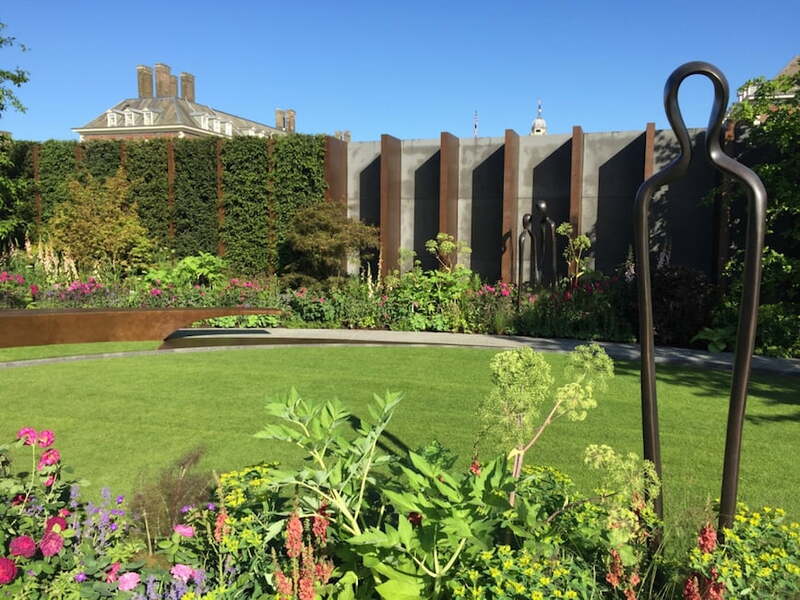 The Morgan Stanley garden for Great Ormond Street Hospital designed by Chris Beardshaw, which won a gold medal and The St John’s Hospice – A Modern Apothecary, designed by Jekka McVicar, which won a silver-gilt medal. Both of these will be relocated at the respective hospitals. 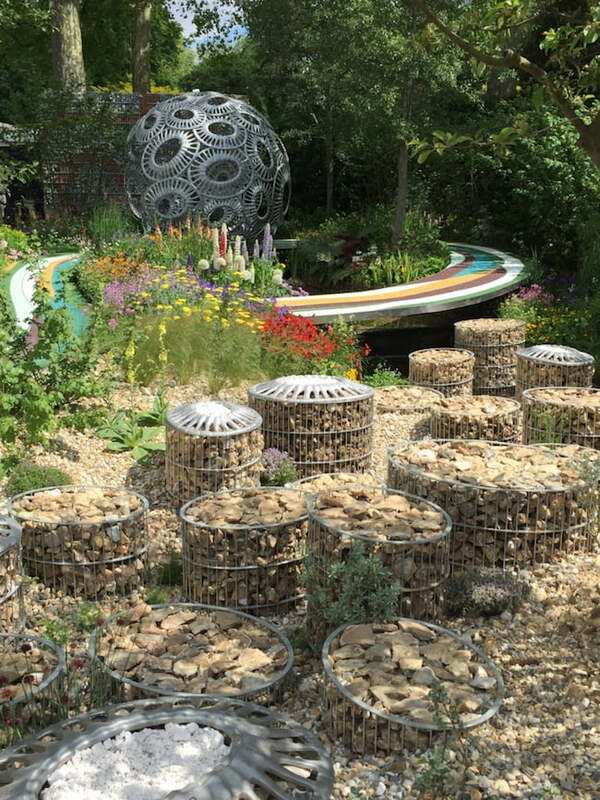 The Morgan Stanley Garden for Great Ormond Street Hospital garden will be installed essentially as is, with the exception of the art pieces and the water feature and all within 4 weeks of the show finishing which is quite a feat! This was a very calm and peaceful garden, not overbearing or overstated, which aligns well with its design intent of being a calm and relaxing space for parents to retreat to on one of the rooftop spaces overshadowed by taller buildings. The garden was designed foremost to suit a shady enclosed rooftop of the hospital, but also applicable to the show context. A remarkable achievement, but I will be keeping an eye on this one to see if it works effectively at the hospital. 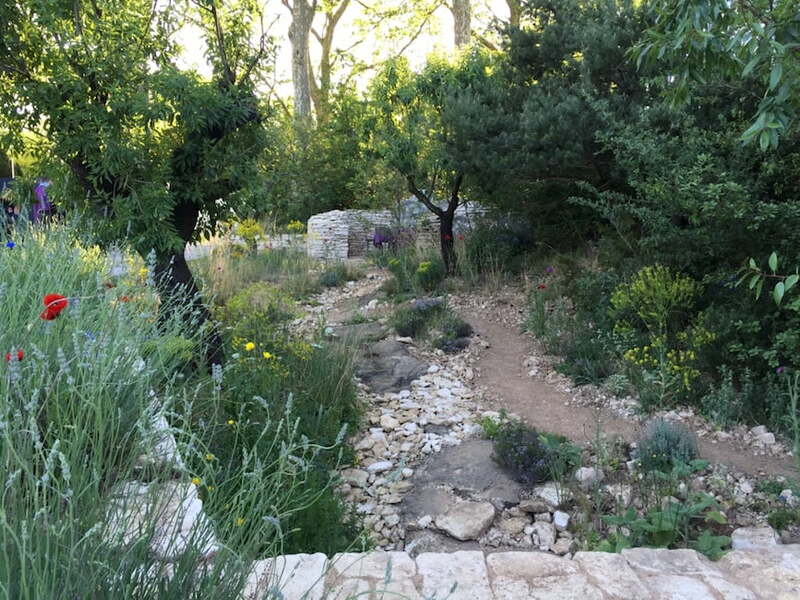 The inspiration for the St John’s Hospice ‘A Modern Apothecary’ garden was based on conversations with doctors and care professionals about what we can do to improve our own health within the context of gardens and plants. This garden will be installed later this year and will be expanded to suit a larger site. All of the plants, statues and central water feature will be relocated with the current stone paths made wider and changed to a different surface to accommodate wheelchairs and beds. All of Jekka’s herbs will be planted in October this year which will bring a wonderful change to what was described as an uninviting space at the hospice. I can just imagine what a garden like this that is filled with fragrant and medicinally focussed plants will achieve for the patients and their families. Sculpture in gardens always evokes differing opinions, however the beauty and intrigue of sculpture is that it is essentially a personal thing. I like sculptural pieces in gardens and enjoy the fact that they provide wonderful opportunities for conversation and allow some to be immersed in creative interpretation. I found this wire lady with copper hair by contemporary artist Rachel Ducker that I think it looked fabulous. I presume it had a name, however I decided to call it “Sunny with a touch of wind on a still day” to reflect my experience of seeing it at the show. I do hope Rachel approves! 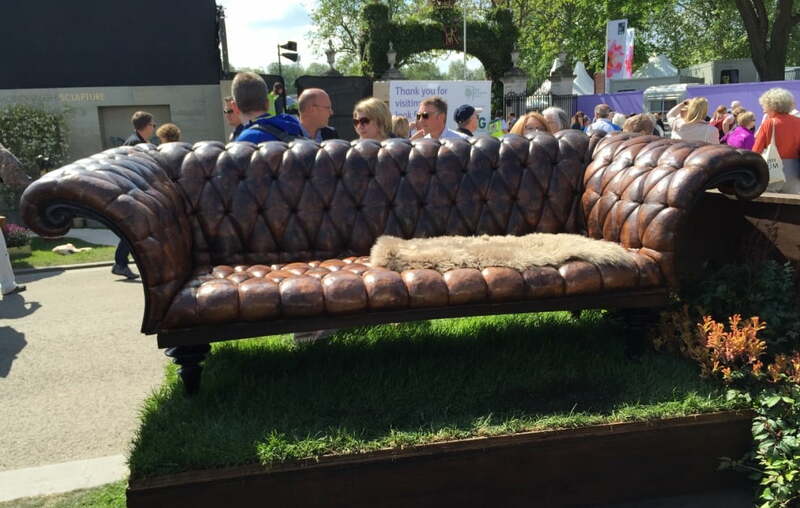 We all enjoy a spot to sit in the garden and this copper Chesterfield couch looked amazing. Created by Stephen Myburgh, I think it would look fabulous in my back yard. Easy to clean and yes, perhaps a little firm to lay on, but let us not worry about the 85,000 pound price tag … I’ll have one please, perhaps! I loved this sculpture by Michael Speller called Illuminate. However, in keeping with my creative interpretation I quite like my Chelsea interpretation of “the sun is out, I’m just putting my foot out to see if it is okay”. 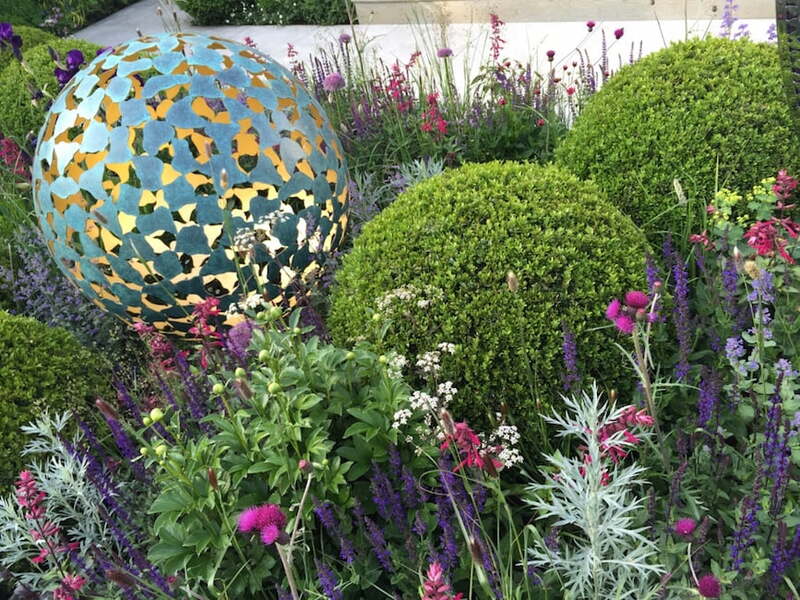 With all of the glorious alliums, perfectly clipped Buxus balls and metal spheres on show I think I can comfortably accept that I have a penchant for round objects in the garden. They just soften spaces that can otherwise look harsh or without interest. 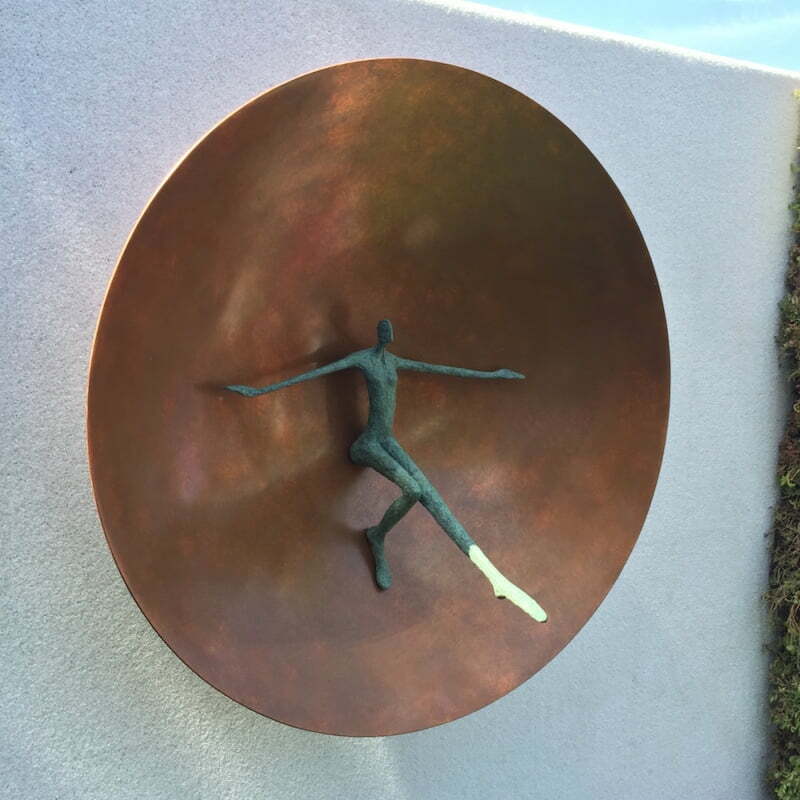 I did love this copper sphere called The Mantle by David Harber which is beautifully balanced with the Buxus clipped balls. 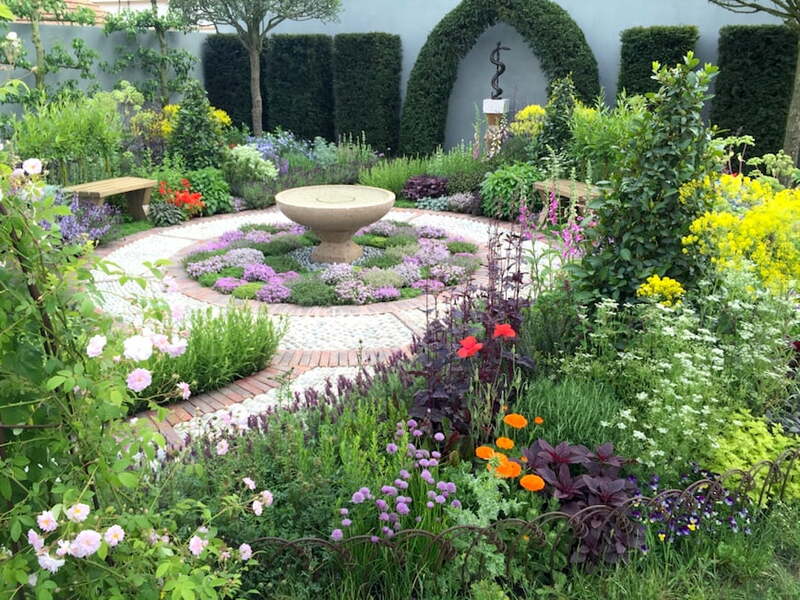 Yes, it is all very English, but this is the Chelsea Flower Show after all! And of course we can’t forget the wonderful opportunity that Chelsea provides for the fashion conscious. With beautifully dressed ladies in the latest fashions, dapper gents in suits and those who delight in the bright and almost gaudy interpretation of floral suits and shirts, it is an event that everyone enjoys and everyone feels comfortable to immerse themselves in. 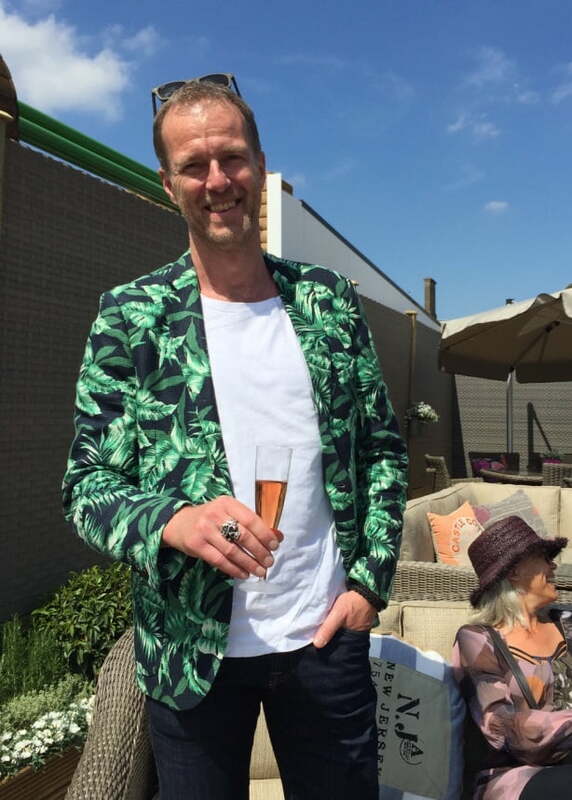 Even the casually dressed can embrace the show and feel right at home in this wonderful show that celebrates all things horticultural. 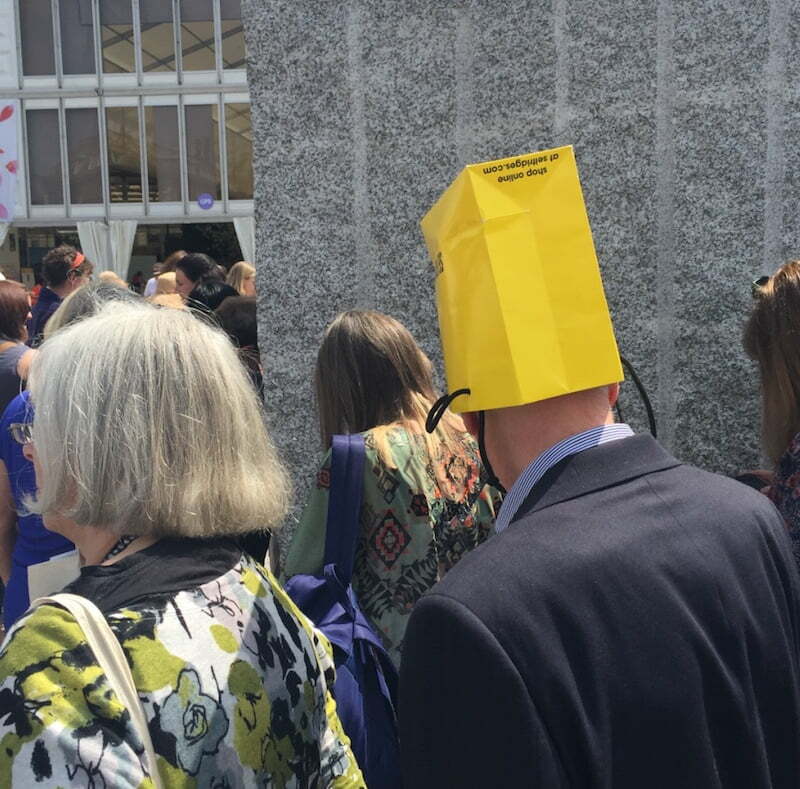 Then there are those who don’t come prepared for the show and need to improvise their fashion accessorizing when the gloriously warm sun comes out to celebrate the Spring growth and sunshine. 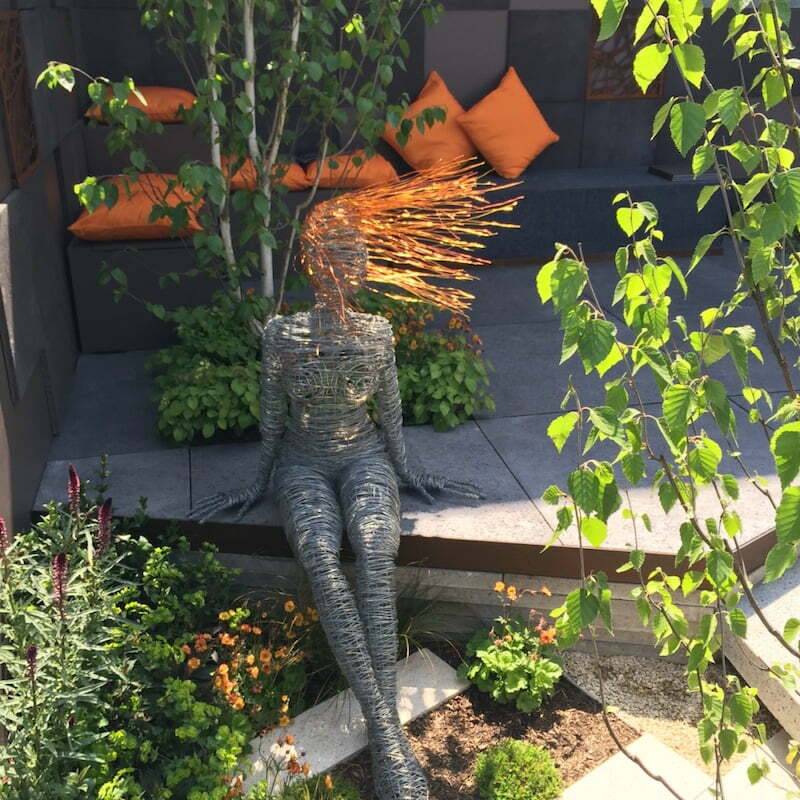 This was my first visit to the Chelsea Flower Show and something that I will remember for a long time. I will leave you with a few final photos to inspire you to keep the Chelsea Flower Show on your list of events to attend. It really is a delight to experience! It is a great show Daniel. One worth experiencing and keeping on the list of places to see! Great reading thanks for the post. Thanks Jeff. It is great to be able to share the fun and enjoyment of the show. I really like the use of copper in several of the gardens – it provides a very satisfying contrast to the plants. It’s great that the two gardens designed for hospital grounds will be delivered to their rightful homes. I imagine both will need a great deal of care, just as the patients who will have the chance to enjoy them. I have a question for you. We were at the Heidelberg Repat yesterday, walking the labyrinth, and afterwards, in the memorial rose garden, we noticed a ground cover we didn’t recognise. It has a grey/green leaf with a small, delicate mauve flower. Can you let us know what it is? Yes I was quite intrigued with this direction of some of the gardens being linked to health and wellbeing and especially these two going to a hospital. Only time will tell if they stay well maintained, but I’m an optimist and presume that they will be! The plant you’re asking about is one of the catmints, but I can’t recall it’s exact species.